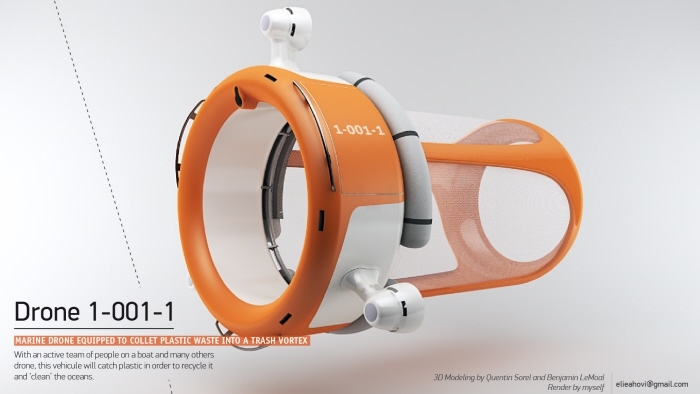 France-based industrial design student Elie Ahovi’s “Marine Drone” concept could be a possible solution to the difficult but necessary task of cleaning up waterborne garbage. Robotic Drones have been a popular topic lately in the media. Whether they’re used for surveillance or combat, the idea of drones patrolling our airspace is one that’s not taken lightly or readily accepted by the public. As we continue to discuss and work out compromises to the ethics and legalities of military drones, it’s important to consider that not all robotic drones are created for violence or espionage. Many of us already enjoy the work of autonomous robots in our daily lives, like the BUFO pool cleaner, the Roomba vacuum, or the Bosch Indego lawn mower. These self-sufficient drones perform routine tasks that normally take a lot of time away from our daily lives. They also make it possible to do tasks that would be costly or dangerous if carried out by a person. The Marine Drone concept designed by Elie Ahovi and his team of collaborators, is a perfect example of a way drone technology can have a positive impact on society and the planet. 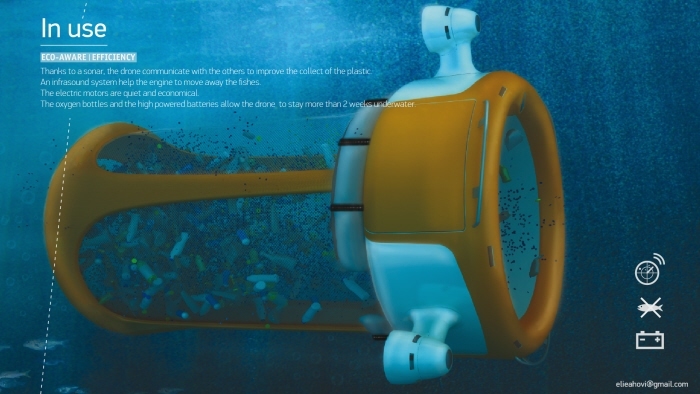 Unlike the military drones that have been the subject of so much controversy, this autonomous robot is designed to operate underwater, and instead of seeking out enemy targets, it will “search and destroy” something equally menacing – ocean garbage. The world was disgusted to learn of the garbage continent floating off in the Pacific, and now it turns out there’s a whole bunch of them floating around in the other oceans as well. That trash isn’t going anywhere either; it’s just slowly decomposing and poisoning ocean life and environments. It’s just a matter of time before it winds up in our own bodies. 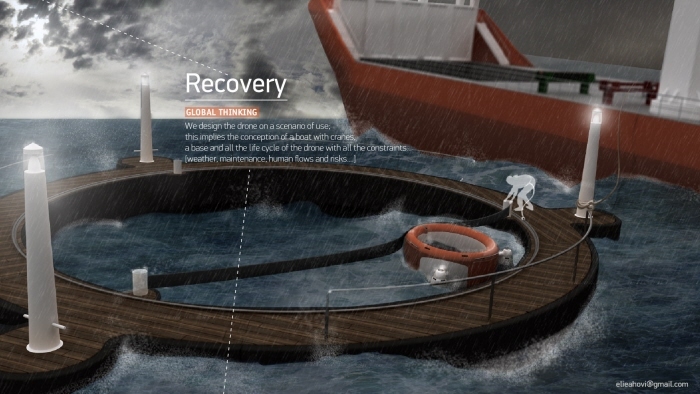 Horrified by the size and scope of the Great Pacific Garbage Patch, and its counterparts forming in ocean all over the world, Ahovi and his classmates from the French International School of Design decided to come up with an easy, yet sophisticated solution. 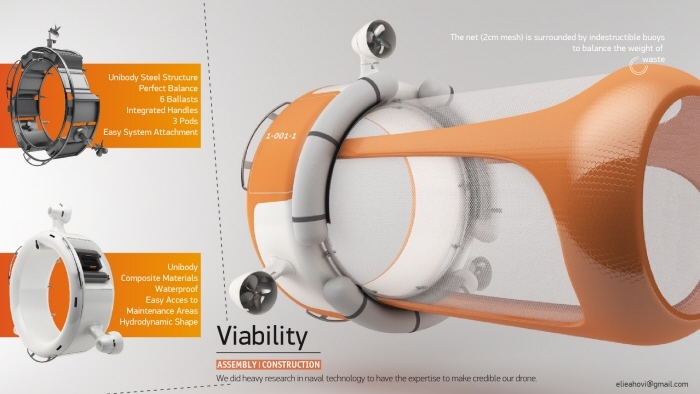 Developed with fellow French International School of Design classmates Adrien Lefebvre, Philomene Lambaere, Marion Wipliez, Quentin Sorel, and Benjamin Lemoal, the Marine Drone would patrol the oceans autonomously, sucking up plastic bottles and garbage into its maw like a butterfly net. Powered by water-proof batteries, the Marine Drone would have and electric motor to move silently through the water. A sonic emitter would send out and irritating signal to keep aquatic life from coming too close, making sure that only trash goes into its net. When its collection area is full, the Marine Drone would then dock with a nearby mothership, where a maintenance crew would crane the garbage up for collection. 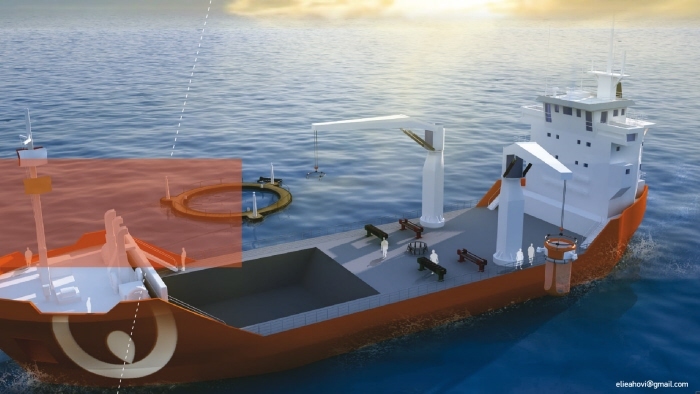 It’s a great concept, and we’d love to see it tested out closer to land first; for starters, they could use a couple of these to clean up New York’s East River. Sure, the thing would occasionally get clogged with cement-shoe-wearing mob informants, but better to work the kinks out here before setting up the deep-sea-going mothership.